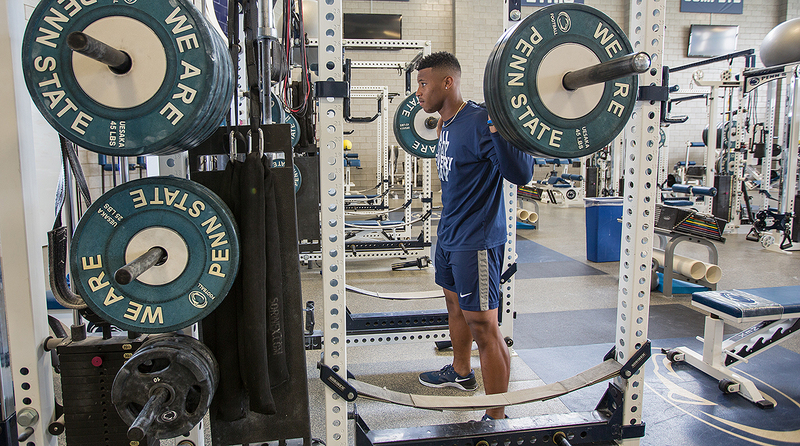 Humble Heisman hopeful Saquon Barkley is known for speed, strength and squats (600-pounders), and Penn State's season rests on the running back's powerful lower half, but just three years ago his future lacked the same aura of inevitability. A similar sense of awe soon swept through the Nittany Lions’ program, as Barkley routinely hurdled safeties and bowled over linebackers. By the end of his sophomore year—during which he ran for 1,496 yards on 272 carries and 18 touchdowns—it had become clear that he would be the next college tailback to crash the top of the NFL draft. The 4.33 40-yard dash Barkley ran during spring testing would have made him the fastest running back at the 2017 NFL combine. His 32 bench-press reps of 225 pounds would have ranked fourth . . . among defensive linemen—and tied a combine record for rushers. Fickell’s opinion is largely informed by Barkley’s breakout game: a 26-carry, 194-yard day against the Buckeyes as a freshman. The Nittany Lions finished that season with seven wins for the third consecutive time but had a full complement of scholarships for the first time in four years after the NCAA sanctions in the wake of the Jerry Sandusky scandal. Barkley has since emerged as the face of the new Penn State. He led the 2016 team to its first double-digit win total (11–3) since ’09 and first Big Ten title since ’08. With 16 starters returning and an offensive line that’s finally not a liability, Penn State has national-title aspirations this season. Like their star tailback, the Lions are on the rise. Barkley set the table for his 2017 Heisman campaign with 249 total yards and three touchdowns in the Rose Bowl. Saquon’s path to stardom starts with his family’s escape from New York. Alibay and his wife, Tonya Johnson, grew up in housing projects in the Bronx. Alibay says he struggled with a crack cocaine addiction for seven years and that as a teenager he served nearly a year on Rikers Island for gun possession. Tonya recalls that drug dealers operated on her block. “We wanted something different for our kids,” Tonya says. In 2001 the couple decided to take their five children—Saquon is the third—and get out. The family eventually settled in Coplay (pop. 3,222), north of Allentown. A photo of Martin Luther King Jr. shaking hands with Malcolm X hangs over the entrance to the dining room. The house is tidy, other than the clutter of Saquon’s awards and trophies, which overflow the shelves. Saquon’s success has presented a new set of problems. Tonya says she gets at least one call or Facebook message a day from agents and financial planners. She also had to figure out how to buy an insurance policy for Saquon and decide on the coverage. She ended up getting multimillion-dollar policies for permanent and total disability or loss of value, but the process was time-consuming and confusing. Two retired numbers are painted on the building’s brick exterior: the 83 of Matt Millen, a former Penn State linebacker who won four Super Bowls with three teams, and the 77 of Dan Koppen, who won two Super Bowls as an offensive tackle with the Patriots. Before Barkley’s number 21 appeared a near certainty to earn a spot alongside them, he took advantage of the no-frills offerings inside it, starting his workouts by gorging on PB&Js. But he needed more than just physical nourishment. As his self-assurance grew, his maturity needed to follow. He missed one practice when he went for a haircut . . . in New York City. He missed another because of a gash on his head suffered on a roller coaster. Whitehall administrators still tease Barkley about how he used to hop along the school’s multicolored floors to avoid the white tiles, which he imagined were lava. They also admit that such playfulness and a halogen smile occasionally helped the kid everyone knew as Sa-Sa wriggle out of trouble. Still, as a sophomore Barkley played only part-time on varsity, which gnawed at him. Academically he lacked motivation at times and struggled in particular with Spanish. Flood & Co. asked Barkley to keep his commitment quiet; they didn’t want to draw attention to their hidden gem. But Barkley proved a secret impossible to keep. In September of his junior year he rushed for 211 yards and four touchdowns on 13 carries against Liberty High in Bethlehem. The game brought national recruiting attention, and Barkley began having second thoughts about Rutgers. Those intensified after he attended Penn State’s 43–40 quadruple-overtime victory over Michigan in October 2013. Flood grew worried enough that he showed up at a Whitehall practice, telling Gilbert he skipped Rutgers practice that day to check in on Barkley. 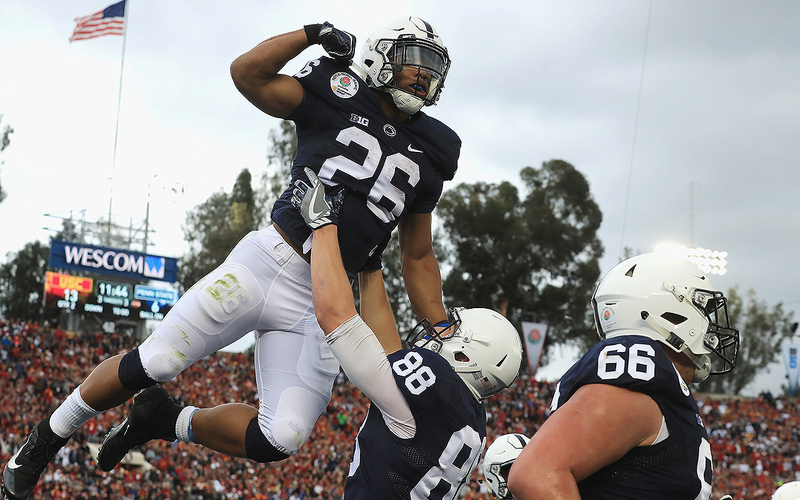 When Barkley finally flipped to the Nittany Lions in February 2014, he ranked as the state’s No. 7 player and the country’s No. 21 running back. A nice prospect, but not one who seemed as if he could carry Penn State out of the trough of mediocrity that followed the NCAA sanctions. Barkley has doubled his personal best since squatting 300 pounds for the first time as a sophomore in high school. No one will argue with the results. The Nittany Lions scored 14.4 more points per game in 2016 than they did in ’15, and their rank in total offense jumped to 49th (432.6 yards per game) from 105th (348.6). The signature win came against No. 2 Ohio State in October. Barkley ran for 99 yards on 12 carries in a 24–21 upset, thanks to a 60-yard touchdown return on a blocked field goal. The victory also highlighted the inherent awkwardness of Penn State’s on-field success in the wake of the Sandusky scandal. Franklin drew criticism nationally for calling the result “a big step in the right direction in terms of healing.” The stigma surrounding the university’s misdeeds still lingers; three administrators were sentenced to jail time for child endangerment in June because of their roles in the case. Any mention of a revival or overcoming obstacles on the field links back to the horrors that led to the school’s punishments in 2012. If so, the central figure will be a freak-show, Frankenstein-creation running back seeking the vein-popping height of his powers.